"Oh, come on!" my wife cried in exasperation. "Can't these people drive?!" She was sitting at the helm of an 18-wheeler DAF truck carrying a load of construction gear from Zurich to Munich, trying to find the right moment to drive into busy intersection while morning commuters kept driving in, not slowing down to let her enter.I was in my usual spot, the passenger seat, taking notes and occasionally honking the truck's massive air horn to no noticeable effect. Finally, my wife decided to take matters into her own hands, simply driving into the intersection and giving a few commuters a good scare. Nobody was hurt, because this all happened in a computer game. That's the power of a good simulator: the responsibility you're given feels real, but not too scary. And just like real life, simulators are very diverse: Whether you enjoy being a mayor, a space combat pilot, a truck driver, or a civilian pilot, you can find at least one simulator in which to live out your fantasy. In this decidedly niche title, you find yourself in the driver's seat of a full-trailer truck, hauling freight across Europe. Vehicle interiors are painstakingly rendered, and countryside views are breathtaking. The climate and time of day change, so you could find yourself enjoying a balmy spring day in one ride, and trying to navigate under torrential rain in the middle of the night in the next. I never thought a truck-driving simulator could be fun, but Euro Truck Simulator 2 ($40) proved me wrong. There is something soothing in watching the world go by from the high and mighty cockpit of a Volvo FH16 Globetrotter XL. If you're used to more traditional racing games, getting used to the way trucks handle in the game may take some time. They really do feel like trucks: Slow to accelerate, jarringly fast to brake thanks to air brakes, ungainly to maneuver, and immensely powerful. 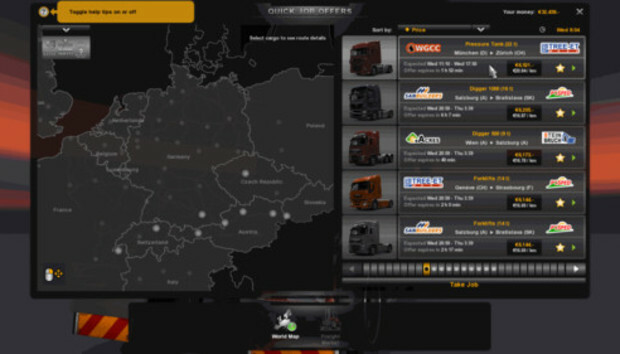 You start the game as a freelance driver for hire, taking on trucking jobs across the continent. From one job to the next, you gain experience, unlock abilities, and set aside a nice nest egg you can eventually use to buy a truck of your own and start a trucking company. Euro truck simulator lets you customize the controls and decide just how much of the driving you want the game to do, and how much you want to handle on your own. Manually switching gears on a truck hauling 20 tons of ore while navigating through a massive open pit mine is no mean feat--which is why it's nice to have the game take care of that detail for you, at least as you're getting started. Euro Truck Simulator 2's attention to detail, convincing physics, and striking visuals transcend its niche status. This is a game so well-made, it can make you a fan of the category just by virtue of its sheer quality alone. While trucking and freight delivery fills an important role in our modern existence, it's just one role. If you're looking to get a better look at the interconnected landscape of a modern city, you'll have to go with something a bit more mainstream: SimCity. Much has been said about the new SimCity. The sad story started with fawning reviews prelaunch, escalated to an outpouring of rage in what has been one of the gaming industry's most embarrassing launches in recent memory, and culminated with EA CEO John Riccitiello's quitting. But in the end, it's a game. It may be overpriced, its DRM may be always-on, but if you ever enjoyed a SimCity game before, this is a game you're going to want to play. Unlike many AAA titles, SimCity holds a wide appeal, attracting both seasoned gamers and casual players. To help acclimate new gamers, the game starts with an extensive tutorial that takes 20 to 30 minutes to complete. Well-made and entertaining, by the time you're done with the tutorial you should be confident enough to take your first steps with a new city of your own. You should also be thoroughly impressed with the new SimCity's graphics, showcased as the tutorial cinematically pans and zooms the map to points of interest. Cities in the new SimCity are much smaller than they used to be: it's not all that difficult run out of map space. This is a balanced by the fact regions are now an intrinsic part of the gameplay. A region is a large swath of land with several designated spots for cities and Great Works, such as a Solar Farm, an Arcology, or a Space Center. Cities within an area can cooperate: One city can pick up another city's trash, and Sims can commute from your picturesque town to the neighboring industrial city. Indeed, cities not only can cooperate in the new SimCity, but they pretty much have to, in order to succeed. If you constrain yourself to a single city, it is all too easy to end up with an average disappointment of a town, a place that excels at nothing, yet tries to do everything. Instead, SimCity lets you specialize your town: You can make it into a gambling hotspot, a mining town, a cultural capital, and so on. Your town isn't limited to just one specailization, either: Given the right resources, you can specialize in more than one field. SimCity's shiny new graphics deserve more than a mention in passing. The game cleverly uses tilt-shift affects to make buildings look like adorable miniatures, both realistic and game-like at the same time. Shadows will move as days go by and night approaches. Nights can be long (depending on the speed you set your game to), and are quite dark indeed. But that only makes daytime all the more impressive. As you pick up a new police station, school, or other public building from a toolbar and move over the map to pick a spot for it, the building will literally hover above the ground, swinging gently from side to side as you drag your mouse. Once you click its designated spot, it will plop down with a resounding thud. At $60, SimCity is by far the most expensive game in this roundup. That leaves it in an awkward spot: In terms of content, quality, and gameplay, SimCity has a very wide appeal, even (and maybe especially) if you're not a hard-core gamer. However, its price tag makes it difficult to justify, especially for the casual-gamer crowd. Is it fun? Absolutely. But is it worth the money? I'd be hard-pressed to say. The latest title in a franchise established in 1989, SimCity is buoyed by its illustrious past. But not all franchises manage such an impressive lifespan: Even great ones fall prey to mergers, acquisitions, and the vagaries of the game business. Such was the fate of FreeSpace 2 ($10), a space simulator originally released in 1999 to great critical acclaim, as part of the Descent and FreeSpace franchise. It was to be the last in the series, due to business circumstances--but it can still be played today, and its source code, released in 2002, has been adopted by an active community of coders and modders. First, the original game: It remains commercially available to this day through GOG, a service specializing in old-time games. While the original FreeSpace 2 offered very impressive graphics for its time, it can't hope to match modern space-sim games in the visauls department. Fortunately, it has a lot to offer in terms of gameplay and depth. Cockpit and HUD controls are intricate and well thought out, from subsystem targeting, through automatic speed matching, to smart indicators on your HUD showing a target's distance and bearing even when it's out of your field of view. FreeSpace 2 also makes good use of the keyboard, with an interface that expects you to memorize many keys. If you enjoy FreeSpace 2's detailed gameplay and wish for nothing more than some updated graphics, you're in luck. Open-source, free mods dress FreeSpace 2 in updated graphics from franchises you probably already know, and include new storylines and game mechanics to boot. I launched myself into Diaspora, a mod based on the Battlestar Galactica 2004 remake, and was impressed by its slick graphics. It was nice to find myself in the pilot's seat of a Viper, trying to prove myself as a nugget (and badly failing). The FreeSpace 2 story only shows that a great simulator will likely live on, business circumstances notwithstanding. After FreeSpace 2 was released, the space simulator market remained relatively dormant for years. FreeSpace 2 and other space combat classics kept the genre alive, albeit on the back burner. That is, until indie game studio Born Ready Games came along and decided to create a modern space combat simulator: Strike Suit Zero ($20). Developing the game was not without its difficulties: When funding ran out midway through the project, Born Ready Games turned to Kickstarter for extra funding. The crowdsourcing website doesn't always work out, but in this case it did: Born Ready raised almost double their original $100,000 goal, and carried on to release the game as planned. The end result is a game with thoroughly modern, gorgeous looks, and simple, intuitive controls that puts you in the cockpit of a space fighter. While the game's controls and HUD are simpler than those of FreeSpace 2, it innovates in the spacecraft department in a big way: You get to fly a giant robot. Most of the time, Strike Suit Zero looks and maneuvers like a typical space fighter. But hit a button on your controller, and it instantly transforms into a hulking mech, armed to the teeth and capable of hairpin turns and aerobatics that just don't make sense in a fighter. Transforming into a robot makes the game feel almost like a first-person shooter...in space. It's a throwback to the old Descent series, the same one FreeSpace 2 eventually evolved from. For example, in one of the early missions you have to destroy a series of storage platforms containing enemy supplies. You can fly at a platform at breakneck speeds, afterburners ablaze, only to transform at the very last moment and find yourself hovering in front of the platform as a fully armored mech, ready to obliterate everything in sight. This makes for a very engaging, cinematic gameplay. Strike Suit Zero is an unforgiving game. While each mission has a number of checkpoints, they are often spaced quite far apart. To make progress, I had to keep going through missions again and again. Dying often means replaying a 10-minute sequence, trying to do better than the last time. It does get frustrating, but it's also fun to see your skill improving from one run to the next. Strike Suit Zero keeps things simple: There is no multiplayer mode, no radar on your HUD, no complicated key mappings to remember. It is easy to pick up, beautiful to play, and challenging to master. If you like the notion of flying, but don't like to do it in outer space, you might want to try Microsoft Flight. Much like SimCity, Microsoft Flight is the current incarnation of a long and illustrious franchise of games, dating back to 1977. Unlike SimCity, you can start playing Microsoft Flight for free. Simply download the game and embark on a series of missions planned to both teach you the basics of flight, and hook you into buying later missions and additional aircraft. And like FreeSpace 2, Microsoft Flight is the last of its kind: Microsoft permanently stopped work on the game in July 2012, just a few short months after releasing this free game. Microsoft Flight's graphics are gorgeous, and the scenery feels realistic. Hawaii serves as the backdrop for the first introductory missions, in which you get to fly two aircraft bundled with the free download: A thoroughly modern Icon Deluxe light aircraft and a WWII-era Boeing PT-17 Stearman biplane. These missions run you through the rudiments of taking off, controlling the craft in the air, and landing. You can fly Microsoft Flight with nothing but a game controller: There are realistic touches like preflight checklists, but in the early stages, the game runs through them on its own, checking items off as you look on. While the introductory missions are interesting and fun to play (especially the landing tutorial) and the graphics were strikingly beautiful, gameplay is marred by having to navigate using landmarks, rather than traditional waypoints. For example: One of the more frustrating challenges starts out midflight, and you're supposed to land the plane. The trouble is, it's not clear where the airstrip is. No heading is provided, and there's no clear way to figure out which way to go. The careful narration that leads you through many of the other missions is utterly lacking on this one. Manually switching on the aircraft's GPS map does reveal an airstrip, but after navigating all the way to it and executing a landing, I discovered it wasn't the right airfield and failed the challenge after all. Another point of frustration is the low number of available missions. Microsoft Flight starts you off with fewer than ten missions and once you want to make progress, you have to pay up. In other words, the game suffers from the same issues plaguing many other "pay to play" titles, and even its fancy graphics couldn't redeem it. It's easy to see why Microsoft ceased development. Whether it's about starting a city, fighting an interplanetary civil war, flying a plane in Hawaii, or hauling freight across the old continent, a solid simulation game will keep you engaged and entertained for hours. There is something relaxing and engaging about these games, and you may only look up from the screen to realize hours have gone by while you were immersed in a world of orderly progress and rising skills. « Will iOS 7 finally make traditional PCs irrelevant?